TIPTON COUNTY, Ind. -- A pool of mosquitoes from Tipton County, Indiana recently tested positive for West Nile. 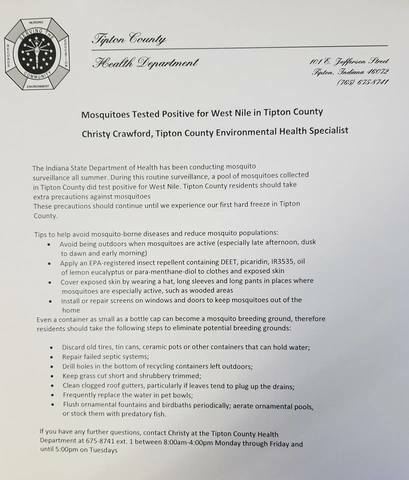 Tipton County Health Department officials say residents should take extra precautions until the area's first hard freeze. Mosquitoes can breed in containers as small as a bottle cap, so people are advised to discard any tires, cans or pots that can hold water, and frequently replace water in pet bowls, among other precautions. Those who may have been infected with the virus can have symptoms including high fever, headache, stiff neck, muscle weakness or paralysis, and confusion.